Breakers won 5-4 against Ventura Tuesday, May 31, and now proceed to a first time ever contest in a CIF final Saturday, June 4. 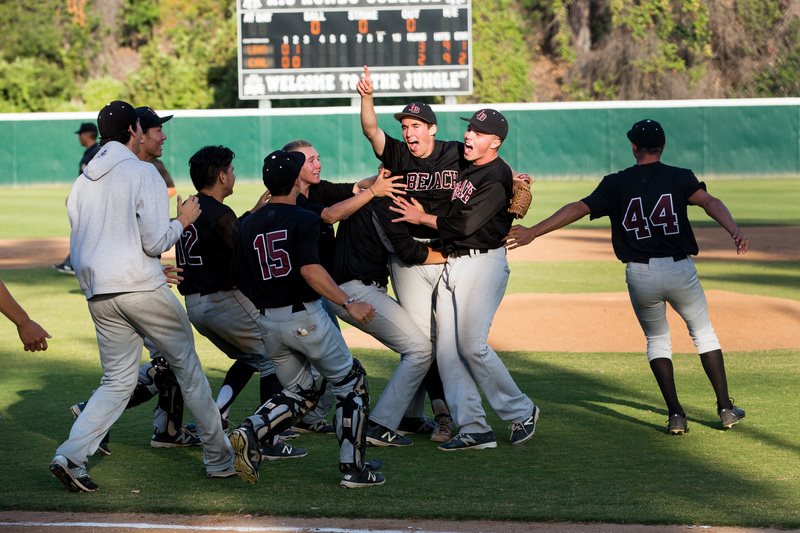 Breakers scored in the bottom of the ninth inning off a bases-loaded walk Tuesday, May 31, to win 5-4 and capture their first trip to a Southern Section CIF final in the 78 seasons of the sport at Laguna. The game will be held Saturday, June 4, at the 66ers Stadium/San Manuel Stadium in San Bernardino at 10 a.m.
Tuesday’s game was Laguna’s third in a semifinal in the program history, with all three games going an extra two innings from the regulation seven. In 1957 and 2014, the Breakers fell short and did not advance. This past week, before the largest home crowd in the program’s history, standing room only spectators were treated to a real game with plenty of emotional swings. The visiting St. Bonaventure Serephs from Ventura jumped to a 1-0 lead, scoring off a wild pitch after gaining two base runners off errors. Breakers came back in the fourth to take a 3-1 lead, but fielding mistakes allowed the visitors to take a 4-3 lead in the fifth. Breakers scratched a tying run in the sixth inning off a single by Jack Simon, scoring Jack Loechner. Breakers held off two Sereph rallies in the seventh and eighth innings when St. Bonaventure had a runner on third with one out before eventually grounding into a double play to end the threat. Blake Burrell pitched the first five innings for Laguna followed by John Ogden’s school-record 18th appearance this season to quickly retire the side in the sixth inning. Once again Will McInerny came in to pitch in the seventh to earn the eventual win after the surprising finish. In the bottom of the ninth, Laguna’s first two batters went quickly for the first two outs. Up came Dustin Angus, who was on a hot streak this game and belted out a double to keep the inning alive. Will McInerny was intentionally walked, sending Zak Kovacic to the plate. Kovacic worked the Sereph’s pitcher for more than a full count, with a number of foul tips spending about 12 pitches before gaining a walk. It took only five pitches after that to send Alex Baker to first and Dustin home for the win. As usual, Skipper Carrillo was on hand in the dugout to witness the historic victory and he will be with the team this Saturday. Carrillo has been a fixture for Laguna baseball for over 50 years and is finally making it to the finals. Laguna served as host to a CIF semifinal game this past Tuesday for the first time since 1957.
inning contest played Friday, May 27, at Rio Hondo College in Whittier. 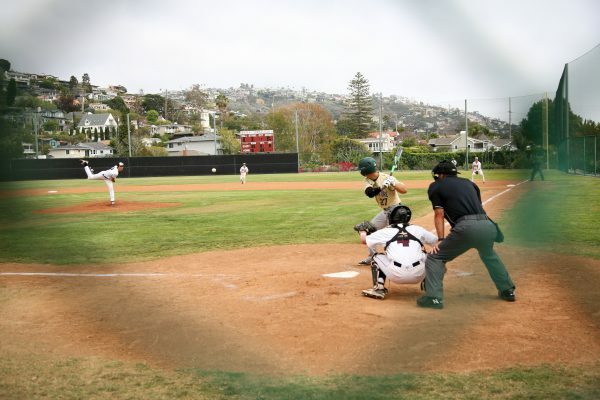 Then, Alex Baker scored off a mishandled hit by Jack Simon in the top of the 12th inning to give Laguna their first lead in the game against California, but it took a nail-biting finish on defense to secure the win. The Condor’s ninth batter grounded to third for the first out, but top-of-the-order hitter Brandon Acosta hit a single. Breakers recorded the second out when Acosta was caught stealing second as Laguna executed the play perfectly. The next batter, Jake Carmichael harmlessly singled putting Gilly Rodriguez at-bat. Rodriguez was the Condor player that hit the fielder’s choice, saving Laguna in the seventh inning. The batter struggled under the pressure and struck out to end the game. Blake Burzell had started the contest for Laguna giving up two runs in the first, but settling down after that to complete five innings of work striking out four. John Ogden came in relief retiring the Condor’s in the sixth inning on just a few pitches. He got into trouble in the bottom of the seventh giving up two straight hits to open California’s first chance to steal the win. In came catcher Will McInerny to pitch. He got the first batter he faced into a fielder’s choice, tagging the lead runner at home and keeping the game alive for Laguna. The Condors next two batters grounded harmlessly to second for routine outs and Laguna escaped. McInerny ended up pitching six innings striking out seven. Breakers had a chance in the 10th inning with a runner on second and third with one out, but could not get them home. Record Watch: The team set a season record this past Tuesday playing in their 31st game of the year. The previous record was 30 games in 2010, 11, and 14. Four players will have played in all 31 games – Jack Simon, Connor Basile, Zak Kovacic, and Will McInerny. Will has also become only the fourth Breaker to play 100 or more career games. Breaker pitching set a season mark last game with 198 strikeouts, breaking the record of 195 set in 2007. Laguna has pitched eight shutouts this season, one short of the 2013 season record of nine. John Ogden set a season record for pitching against California with his 17th season appearance, breaking the record of 16 set in 1969 by Steve Shapard. The tennis team had tough competition at the Jack Kramer Club in Rolling Hills for the Southern Section CIF Individuals on Thursday, May 26. Doubles team Ethan Gee/Hayden Seitz lost to Cerritos’ top team 5-7,1-6; Taylor Sokolovic / Mason Lebby lost to Newport Harbor’s top team team 1-6,0-6. In singles, Tristan Krogius lost to Westminster’s top player 5-7,1-6; and Ryan Gee lost to Corona del Mar’s second-best player 1-6, 1-6.